Can a university withhold your transcripts? The answer from a lawyer. You work hard, put the time in, and make good grades. Maybe you decide you want to transfer to another college, or maybe you graduated and want a copy of your final official transcripts. You submit the request and are told no by your university. There has been a hold placed. Can a university withhold your transcripts? Yes. If you owe money or have not satisfied another requirement, the school can place a hold on your official transcripts. Now your transcripts are part of your education record and fall under FERPA, so the university cannot keep your records from you. However, giving you your official transcripts and letting you view them are two separate things. Schools must allow you to view your transcripts. Schools do not have to give you your official transcripts if you have outstanding obligations. Placing a hold on your transcripts is one of only a few ways a university has leverage against a student. Is there a way to get the school to release my transcripts? Yes. Depending on the amount of money or obligation, you may considering paying it or attempting to negotiate the amount. If it is thousands of dollars, you may need to get an attorney involved to negotiate on your behalf. 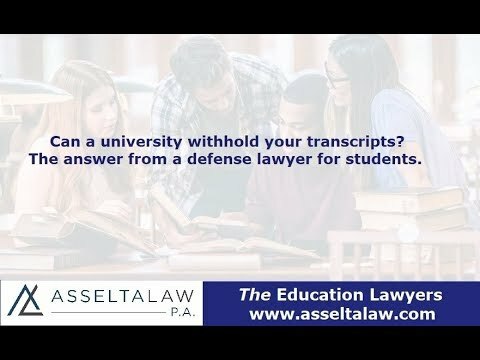 Richard Asselta is an award-winning attorney who assists students with transcripts and degree issues. He also defends students facing Honor Code, academic integrity, and code of conduct violations.